Sure we all can walk into our favorite corner shop, stare straight at the candy aisle shelf at eye level, grab the Snickers or Reese’s (and now the Haribo) and other default “big candy” wares right at our fingertips. OR – you can search out the little guys. The folks who have a burning desire to make something different, who are fine with going up against the Cadbury’s and Hershey’s of the world, who have recipes they are dying to share. This is what I think we have with Sweet Gecko. Although…TBH…I can’t find much bio info on the group. There are a sh(*& ton of them in that there box. And they’re big. Plus, they look like orange slices. Did I mention I think oranges are the most underrated fruit? These lollies are pretty big, like sand dollar size. And the citrus flavor is great. It tastes genuine. According to their site, they use “the best ingredients”. (Although…what does that mean really?) 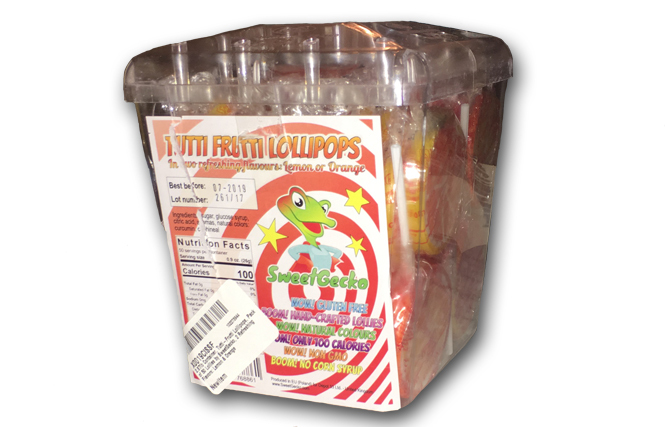 No artificial coloring, corn syrup, gluten or genetically modified organisms (Non GMO). So that’s very good for those of us with allergies. Annnnnd: each serving is only 100 calories. Take that, fat. 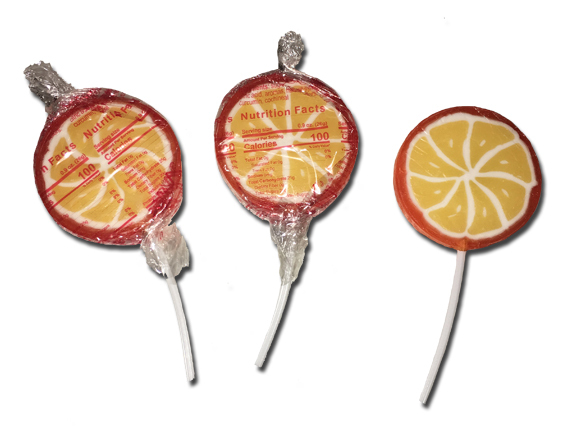 The lollies are listed as tutti-frutti on the web site and I’m not sure what that means. Still, these pops are pretty good. They last a long time, made by an up and comer, and won’t add to your waist. In the package you get like 50 lollies – so go ahead and buy them for the office and say: “You all are every welcome for my generosity.” Seriously, do it. People love it when you tell them how great you are.